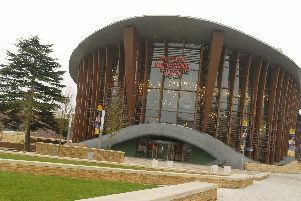 With the wow-some production of The Bodyguard lingering on in minds, MK Theatre prepares to ace us again this week coming, when Chitty Chitty Bang Bang parks up. And it is promising to have viewers flying high with a heady mix of madness, intrigue and exuberance. It certainly did that in the West End where one of the world’s most favoured musicals smashed all box office records. Belt up and prepare for a ride and a half! We’ve got a grand parade of faces taking you to far off places through the power of the stage work too – Michelle Collins, for one. And re-invent herself she does – she actually has two roles in the show. “In the first half I play Mrs Phillips, secretary to Lord Scrumptious. She’s quite passive-aggressive and is secretly in love with him, I think. And though she won’t reveal who, Michelle says that her Baroness has been based on someone in the public eye. For Michelle, the music in Chitty is what gives it added oomph, and though she’s not new to the world of musicals, she didn’t spend years sweating in dance studios, either. “I am definitely not a West End Wendy type,” she laughed. But she’s a professional, and on her game. And she’s got those stage moves licked. And she’s had to apply herself to some particularly tough challenges with Mr Grylls, the survival expert, recently. “It was seriously hard-core,” she says of the time she spent in the South African bush. Chitty Chitty Bang Bang reunites Michelle with another former Albert Square dweller, Shaun Williamson, who also plays two roles in this production - Baron Bomburst and Lord Scrumptious. It’s been years since either has appeared in the EastEnders credits, and yet conniving Cindy Beale and trier Barry Evans are two of the most memorable characters in its three-decade history, thanks to those the two breathing life into the roles. Any down time she does get in between shows is easily filled – she currently has a children’s book and a short film taking attention. But on Wednesday the flying car and its occupants will land (or park...which works best?) in town for an 11-day stay that, to coin a phrase, will be simply fantasmagorical. Book your seat on 0844 871 7652. CCBB focuses on the loveable but wacky inventor Potts who has to outwit the bombastic Baron Bomburst who has decreed that all children be banished from his kingdom. Helping Potts will be his two children and the gorgeous Truly Scrumptious...but what happens when the children are caught and imprisoned by the evil Childcatcher? We can’t say, but we can tell you that there is a happy ever after with this piece, which also stars Lee Mead as Caractacus Potts and Carrie Fletcher Hope in the role of Truly Scrumptious.